Dr. Margaux Ascherl (fourth from left) from John Deere talks tech with a group from the Consumer Technology Association. The hulking green giant loomed large in the South Hall of the Las Vegas Convention Center. 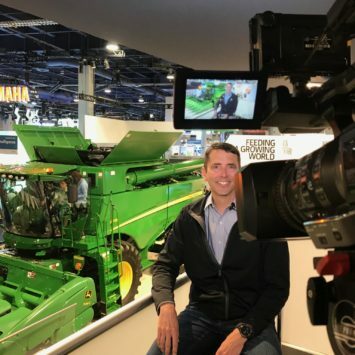 The magnetic pull of the 20-ton, S-770 combine was inescapable, drawing curious visitors at the 2019 CES (Consumer Electronics Show) into John Deere’s booth for a closer look at the technology-packed machine. It was the first time a combine ever appeared at the world-renowned technology trade show (held Jan. 8-11); it was also the first time John Deere appeared at the show. The combine was, for many visitors, the perfect place for a selfie photo. 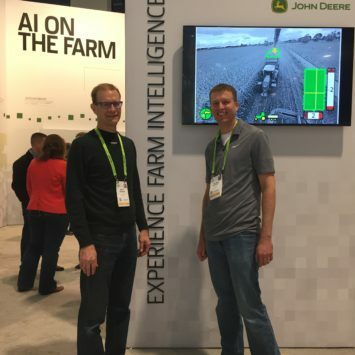 But it was also a point of entry to learn more about how Deere is working with artificial intelligence (AI), cameras, sensors, and self-driving technology on the farm. For many visitors and representatives of the tech media, John Deere’s appearance at the world’s-biggest technology show was initially a mystery. At first many didn’t understand what they were seeing when they came upon the green and yellow machines and displays. 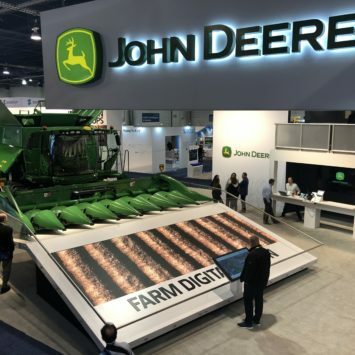 But the John Deere team at CES demonstrated just how much smart technology is already part of the company’s products and services – not a concept for the future. “The tech industry knows Deere as the muscle in farming, but we wanted to highlight the brains of our products as well,” said Alex Purdy, director of Precision Agriculture Technology: Strategy & Business Development for John Deere. 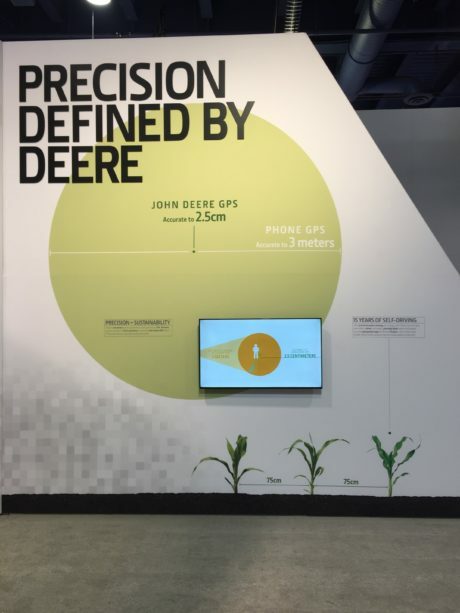 The company decided to display at CES to tell the story of how Deere is using technology to help growers sustainably produce consumers’ food — and demonstrate how Deere is a technology leader. 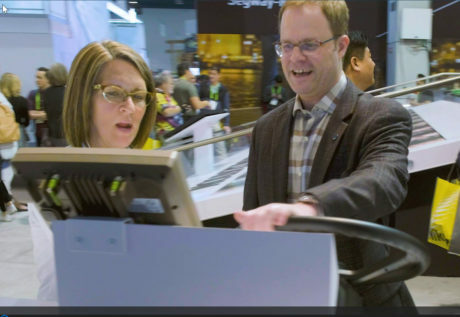 Interactive displays showed how John Deere is on the leading edge of smart technologies like advanced computer vision, sensor fusion, edge computing, AI, machine learning – and is deploying them on a fleet of Deere machines on farms around the world. The John Deere team demonstrated just how much smart technology is already part of its products and services – not a concept for the future. The S-700 Series combine featured an ever-changing video display screen. John Stone, senior vice president of John Deere's Intelligent Solutions Group, talks tech with the media. Dohn Pfeiffer and Zach Bonefas from John Deere prepare for the CES show. Willie Pell, director of New Technology at Blue River, demonstrates how Deere is using cameras and sensors in its equipment. 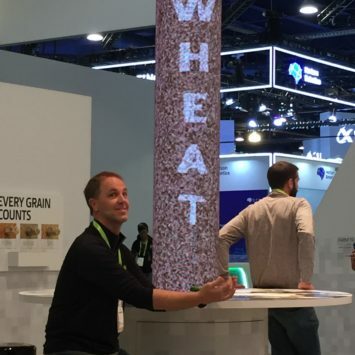 Joel Hergenreter from Deere's Intelligent Solutions Groups carries the wheat of the world in preparation for the CES show. Carrie Trenkamp from John Deere's Intelligent Solutions Group shows off a self-driving technology simulator to a visitor. The Deere booth, located in the heart of CES’s displays on artificial intelligence, was definitely in the right place. Using GPS, Deere equipment can move through the field with 2.5 centimeter accuracy using self-driving technology. Many visitors to the John Deere booth had no idea the company currently integrates so much technology into its products, according to Purdy. Visitors also saw displays featuring other forms of artificial intelligence, including a Blue River See & Spray unit. A video display showed how the technology allows growers to use AI and robotics to apply herbicide with accuracy. See & Spray leverages deep learning to identify a variety of plants — both crop and weeds. The display demonstrated how the technology reduces both herbicide use and input cost for growers, doing more with substantially less. “The equipment Deere is producing allows growers to make decisions about their crops at an individual plant level versus the entire field,” Purdy said. 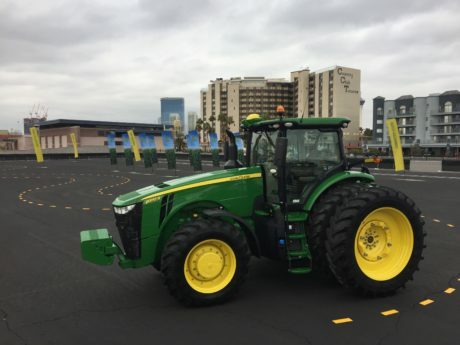 Outside of the convention center, Deere had a self-driving tractor display set up on a prescribed route through a demonstration track. Outside of the convention center, Deere had a self-driving tractor display set up on a route through a demo track. 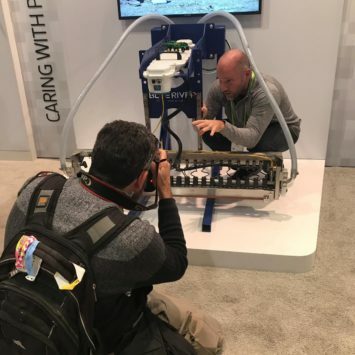 Members of the tech media got a firsthand look at how precision guidance, cameras and sensors and the importance of repeatability work together. Deere representatives helped explained the self-driving technology that, for Deere, isn’t new. 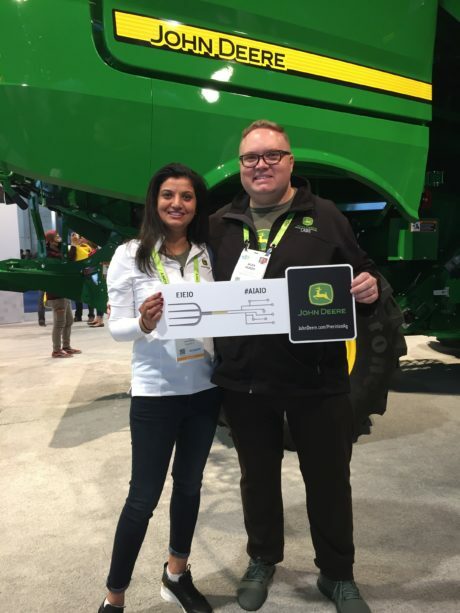 Sona Raziabeegum, strategy lead, digital for John Deere and Alex Purdy, director of Precision Agriculture Technology: Strategy & Business Development for John Deere, show off a "selfie" sign to encourage show goers to take a picture in front of the S700 series combine. 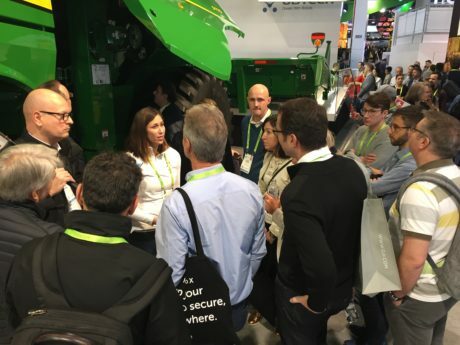 For many visitors who saw the self-driving tractor and John Deere booth, it was their first up-close look at how technology and agriculture are working together to feed a growing world. But Purdy said he was most surprised by how quickly visitors understood how the technologies were being applied to farming. See how Deere is making an impact in technology & innovation through the stories below.